As an assistance dog organization in Florida, our client base consists of those seeking only mobility dogs. Our mobility dogs are geared for individuals with disabilities such as balance issues and those utilizing wheelchairs or other assistive devices due to physical disabilities that impact their mobility. Potential Genesis clients are required to fill out an initial application which is then reviewed by the Director of Training and an Advisory Board. The process will continue based on the needs of the applicant. If the Advisory Board feels Genesis can help the candidate, the applicant will be contacted to schedule an interview, and be sent a detailed application for completion. If the Board feels the candidate is not an appropriate match for a Genesis Assistance Dog, the candidate will be notified. 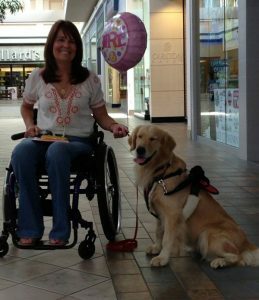 Determination as to whether an applicant qualifies to be considered for a Genesis assistance dog in Florida is based upon the ability of the person to physically and emotionally care for a dog, as well as the applicant’s medical condition and living environment. The entire family must be engaged in the process of having a dog as a member of their family. If the client is unable to physically manage and care for the dog, there must be a caregiver designated to provide for the daily care and needs of the dog. If the applicant is approved, he or she will be notified and placed on the waiting list. Genesis will contact the applicant approximately twice a year to update their status. At this time the candidate should provide any updates to their medical condition, family circumstances, changes in living arrangements or if they have applied to other service dog organizations. Genesis takes great care in matching our clients with the most appropriate dog. Dog placement is a complex matching process and is not based upon your place on the waiting list. If you are interested in applying for a mobility assistance dog in Florida, please complete our client application. If you have additional questions, please contact us.